China is evidently pushing hard to become a world leader in scientific endeavour. Over the last 2 decades this nation has more than trebled the annual financial outlay made into research as a proportion of its gross domestic product (GDP). It currently invests 1.98% of its sizeable GDP for this purpose, thereby outperforming the EU's 1.96% overall average and closing in on the United States' 2.8%. Due for completion in mid-2016 timeframe, the Five Hundred Meter Aperture Spherical Radio Telescope (FAST) is a one of the most high profile projects that China is presently undertaking. 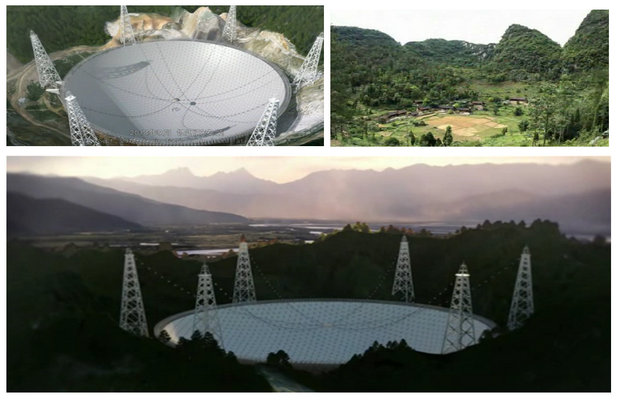 For this 100 million dollar venture a 500m diameter reflective dish (weighing 11,000 tonnes) is in the process of being built within a large basin-shaped valley situated in the south west of China. Once it is finally completed, FAST will be the world's largest and most sensitive radio telescope by a considerable margin. Radio telescopes are reliant on their reflective surface to collect, then focus incident radio waves so that they can be analysed, and with a total area of almost square kilometre being made available, FAST will be 3 times more sensitive than the world's next largest telescope (at the Arecibo Observatory in Puerto Rico). It will be able to capture radio frequency (RF) data from a distance of over 7 billion light years. The colossal scale of FAST means that its reflective surface is not movable in the way that traditional radio telescopes are. An alternative mechanism therefore has to be utilized in order to orientate the reflector element in such a way that it can explore different areas of the night's sky. To accomplish this, rather than having a single solid reflective surface, as conventional radio telescopes do, engineers designed FAST's reflecting surface so that it is made up of 4,450 triangular aluminium plates. Each one of these plates will have the capacity to be angled individually using its own separate motor system. This means that it is possible for a multitude of different potential reflection parabolas to be created. The RF receiver will then be moved across the face of reflector, using cables, so that the focal point can be adjusted accordingly. Thanks to this innovative adjustable reflecting plate arrangement, FAST will support a 40° deviation from its zenith, whereas the Arecibo telescope (which has a reflective surface that is completely fixed) can only manage a 20° deviation. As a result FAST has the resources to acquire RF data for from 19 different sky regions, as opposed to the 7 that the Arecibo telescope can achieve. To control the movement of the reflective surface, hydraulic cylinders are being placed under each of FAST's reflective plates. These will be complemented by electro-hydraulic actuators which will be responsible for taking care of plate movement. Correct positioning of every one of the reflective plates is going to be critical to FAST's operation. Any inaccuracy in this could have huge impact on the quality of compiled data. Furthermore, the long term effectiveness of the positioning system needs to be assured, especially as the telescope is located in a very remote region where repairs will be difficult and costly to carry out. Every one of the cylinders in this set up is going to integrate an E-Series magnetostrictive position sensor from MTS Sensors, based on the company's proprietary Temposonics® technology. Magnetostriction causes changes to the dimensions of ferromagnetic materials when they are placed in a magnetic field. Through the Temposonics® sensing structure, application of magnetostrictive principles allows accurate determination of position to be realized via the momentary interaction of two magnetic fields. One of these fields originates from a movable permanent magnet that passes along the outside of the sensor, while the other field comes from a current pulse applied along the ferromagnetic waveguide running parallel to the direction that the permanent magnet traverses. When these magnetic fields interact, a sonic torsion pulse is generated which passes through the waveguide and is subsequently detected by the sensing element. 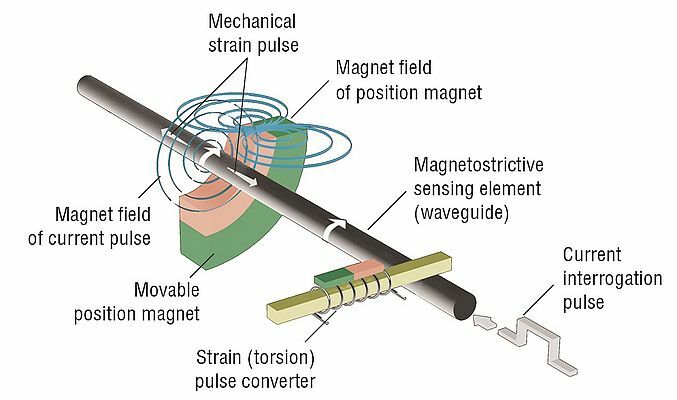 Precise measurement of the time period between the current pulse being applied and the torsion pulse being received makes it possible to derive an exact value of the distance to the movable magnet. The E-Series devices specified by engineers for the FAST project offer a compelling combination of robustness, cost-effectiveness and compactness. The continued accuracy of these sensors is truly industry leading, with <0.02% (full strength) linearity deviation and 0.005% repeatability (full strength). They each have a digital synchronous serial interface (SSI) output which facilitates system integration and ensures high levels of signal quality. E-Series devices are enclosed within IP69K-rated housings, which help to protect them against liquid ingress, high temperature and high pressure conditions, as well as allowing them to cope with wash downs. Their stainless steel construction makes them highly optimized for placement within hydraulic cylinders. The stroke length range of E-Series units goes from 50mm right up to 2500mm. They can cope with 100g shock (in accordance with the EN 60068-2-27 standard) and 15g vibrational force at frequencies of 10Hz to 2000Hz (in accordance with EN 60068-2-6). Their operational temperature range spans from -40°C to 75°C and a 90% relative humidity figure is supported. The magnetostrictive sensing method that has been pioneered by MTS Sensors offers a highly accurate and reliable method by which to ascertain position. Sensors that employ this technology are effectively wear-free and are thus highly suited to deployment in extremely demanding settings. Temposonics® sensors can cope with vibrations, heavy shocks and high pressures without any loss in their reliability or performance. In addition, they support extensive temperature ranges. As their outputs correspond to an absolute position, rather than a relative value, the need for recalibration work is eliminated. This greatly simplifies the maintenance process. It is clear that, despite the current economic downturn, investment into scientific progression will continue to be a priority to countries all over the world. The desire to learn more about the universe has not been in any way abated and ambitious, ground-breaking projects like FAST are underlining the strong commitment that is being made.